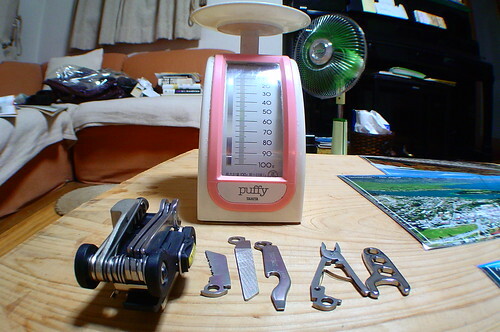 Today begins a series of posts on reducing the weight of my gear that I’ll be taking on the trip. Not one measley one gram will escape my obsessive eye. This war on weight is in part inspired by another recumbent rider, also called Rob, who is currently slowly being grilled like an English Rice Pudding under the Chinese sun on his way through a 25,000km trike ride around China. Hang in there, Rob! 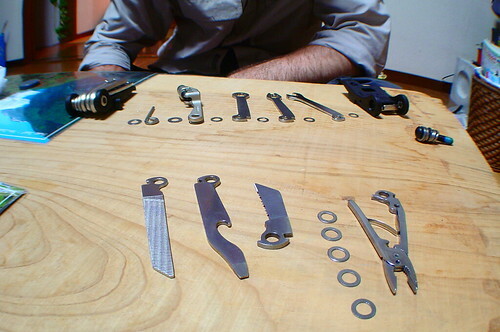 Today I removed the unneccessary tools from my bike multi-tool. 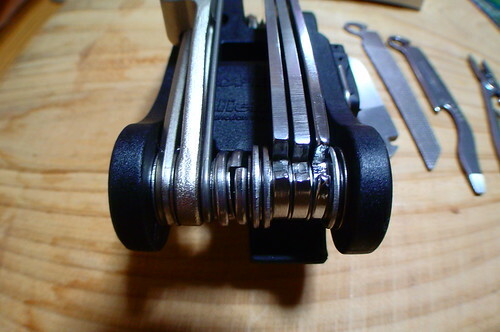 The ones I removed are not only small and useless (take a look at the ‘pliers’ there – they are too small to be of any use), but they are also found in much more substantial form on my large folding pliers multi-tool. Are you going to update your gear lists with what you are planning to bring? (clothing, etc) We could help you pick out what you can leave behind. Now you're getting down to the nitty gritty. Ooh ooh yes, I like that idea. 1. Eeling waders. Although they do make for memorable photos when worn inside, it may not be worth your effort. 2. Green corduroy bean bag. However fabulous a headwear accessory, as modelled by the famous Calvin, this too is a cumbersome travel item. 1. The t-shirt of woolly-hat-clad mountain-summitters. Saves you getting pestered about whether you're that colour all over. Just show them the shirt. 2. Large bandages. Aside from their traditional use, these provide extra warmth on cold nights. When carefully positioned and combined with a little tomato sauce, they may also earn you a night in a nice warm hospital bed if you get tired of your tent. Kirk, the gear lists will be updated just as soon as I can face actually lining it all up and taking an inventory. Probably tomorrow. Lee, I will take your advice and leave the waders behind then. Too bad though…I think I really suit them. What about the kilos and kilos you're supposed to put on? Have you been following through with that all ice-cream and bacon diet we discussed? Dave, the diet is working a charm. I'm now 77kg. Just a few more to go, and I'm all set! Crazy to think you will bike almost as far as I've flown lately. Hope all is going well. Cutting off a leg is a good weight loss program. Malcolm, I agree. Probably don't need all that blood anyway.